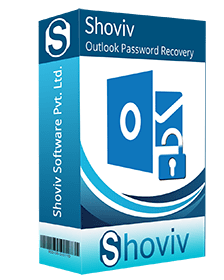 Quick password recovery from protected PST files and then accessing the PST mailboxes within Microsoft Outlook email client become easy when you use our PST Password recovery tool. The password applied on Outlook PST files has any kind of length and any language; you will get the process of unlocking password from PST files properly done without finding any concern. Forgotten passwords can also be recovered easily. You will be able to find 3 different passwords, if the process has been applied to the 4 digits ASCII/Multilanguage PST files. Amongst these 3 new passwords, the one can be chosen to reset the PST password or to unlock PST password to access the data from PST file. Unlocking or resetting PST files' password is applicable for all the PST files generated through older to earlier version of Outlook 2016, 2013, 2010, 2007 etc. 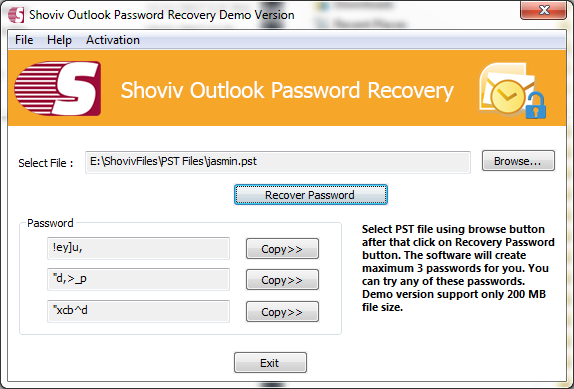 This tool has power to work without taking too much time to recover PST Outlook password. The high end algorithms of the software work for quick actions to reset the Outlook PST files' password. No matter in which language the password has been applied. No matter password is made of string, symbol, number or any special character with any length, our tool will properly work. It works to eliminate and reset the password of Outlook PST files those are heavy and are categorized as oversized PST files so without any hassle you can use it properly. If you think that the tool may not work with PST files created in older versions of MS Outlook application then, eliminate this thought and use the software with PST created with any mode of MS Outlook software. If you have not been using any software till the date and worried how to use Unlock Outlook Password then, just start working with it by keeping all worries away, it is simple to handle. It is supportive for all the Windows editions when it is all about to unlock PST password so, without thinking how to use it old or new version of MS Outlook, you can use it with the same ease in new and old Windows. Is the cost of the Unlock PST Password tool is affordable? Indeed, it’s is affordable for all those users who utilize software frequently. It won’t expensive or unaffordable for them. Is there any limitation to upload files from Outlook? No, there is no restriction at all. Which type of Passwords can be eliminated in this Unlock Outlook Password tool? Unlocking multilingual and lengthy password including strings, characters, and many other special characters will not be a daunting task when using this high-end application. Can I connect to around "o" clock support services if I found any issue? Sure, we’re here happy to assist you and take you out from any kind of hurdle during execution. You can connect our 24*7 technical support services without having a glance on the clock of your gorgeous room.